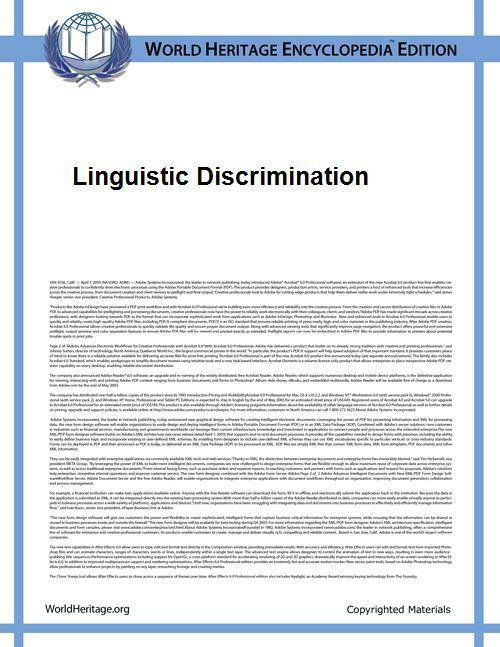 Linguistic discrimination (also called linguicism and languagism) is the unfair treatment of an individual based solely on their use of language. This use of language may include the individual's native language or other characteristics of the person's speech, such as an  Based on a difference in use of language, a person may automatically form judgments about another person's wealth, education, social status, character or other traits. These perceived judgments may then lead to the unjustifiable treatment of the individual. In the mid-1980s, linguist Tove Skutnabb-Kangas, captured this idea of discrimination based on language as the concept of linguicism. Kangas defined linguicism as the "ideologies and structures which are used to legitimate, effectuate, and reproduce unequal division of power and resources (both material and non-material) between groups which are defined on the basis of language." Although different names have been given to this form of discrimination, they all hold the same definition. It is also important to note that linguistic discrimination is culturally and socially determined due to a preference for one use of language over another. It can be noted that use of language such as certain accents may result in an individual experiencing prejudice. For example, some accents hold more prestige than others depending on the cultural context. However, with so many dialects, it can be difficult to determine which is the most preferable. The best answer linguists can give, such as the authors of "Do You Speak American? ", is that it depends on the location and the individual. Research has determined however that some sounds in languages may be determined to sound less pleasant naturally. Also, certain accents tend to carry more prestige in some societies over other accents. For example, in the United States, an absence of an accent or "speaking American" is widely preferable. Also, in the United Kingdom, the Received Pronunciation is associated with being of higher class and thus more likeable. In addition to prestige, research has shown that certain accents may also be associated with less intelligence, and having poorer social skills. An example can be seen in the difference between Southerners and Northerners in the United States, where people from the North are typically perceived as being less likable in character, and Southerners are perceived as being less intelligent. It is natural for human beings to want to identify with others. One way we do this is by categorizing individuals into specific social groups. While some groups may be readily noticeable (such as those defined by ethnicity or gender), other groups are less salient. Linguist Carmen Fought explains how an individual's use of language may allow another person to categorize them into a specific social group that may otherwise be less apparent. For example, in the United States it is common to perceive Southerners as less intelligent. Belonging to a social group such as the South may be less salient than membership to other groups that are defined by ethnicity or gender. Language provides a bridge for prejudice to occur for these less salient social groups. Linguistic discrimination is often defined in terms of prejudice of language. It is important to note that although there is a relationship between prejudice and discrimination, they are not always directly related. Prejudice can be defined as negative attitudes towards an individual based solely on their membership of a social group, while discrimination can be seen as the acts towards the individual. The difference between the two should be recognized because an individual may hold a prejudice against someone due to their use of language, but they may not act out on that prejudice. The following are examples of linguistic prejudice that may result in discrimination. While, theoretically, any individual may be the victim of linguicism regardless of social and ethnic status, oppressed and marginalized social minorities are often its most consistent targets, due to the fact that the speech varieties that come to be associated with such groups have a tendency to be stigmatized. The Charter of the French Language, first established in 1977 and amended several times since, has been accused of being discriminatory by English speakers. The law makes French the official language of Quebec and mandates its use (with exceptions) in government offices and communiques, schools, and in commercial public relations. Though the proportion of English speakers had been in decline since the 1960s, the law accelerated this, and the 2006 census showed there had been a net drop of 180,000 native English speakers. Conversely, the law has been seen as a way of preventing linguistic discrimination against French speakers, as part of the law's wider objective of preserving the French language against the increasing social and economic dominance of English. Speaking English at work continues to be strongly correlated with higher earnings, with French-only speakers earning significantly less. Despite this, the law is widely credited with successfully raising the status of French in a predominantly English-speaking economy, and has been influential in other countries facing similar circumstances. Here and elsewhere the terms 'standard' and 'non-standard' make analysis of linguicism difficult. These terms are used widely by linguists and non-linguists when discussing varieties of American English that engender strong opinions, a false dichotomy that is rarely challenged or questioned. This has been interpreted by linguists Nicolas Coupland, Rosina Lippi-Green, and Robin Queen (among others) as a discipline-internal lack of consistency that undermines progress; if linguists themselves cannot move beyond the ideological underpinnings of 'right' and 'wrong' in language, there is little hope of advancing a more nuanced understanding in the general population. Because some African-Americans speak a particular non-standard variety of English which is often seen as substandard, African-Americans are frequently the targets of linguicism. African American Vernacular English (AAVE) is often perceived by members of mainstream American society as indicative of low intelligence or limited education. Furthermore, as with many other non-standard dialects and especially creoles, AAVE sometimes has been called "lazy" or "bad" English. The linguist John McWhorter has described this particular form of linguicism as particularly problematic in the United States, where non-standard linguistic structures are frequently judged by teachers and potential employers to be "incorrect," in contrast to a number of other countries such as Morocco, Finland and Italy where diglossia (a single person being able to switch between two or more dialects or languages) is an accepted norm, and use of non-standard grammar or vocabulary in conversation is seen as a mark of regional origin, not of intellectual capacity or achievement. For example, an African-American who uses a typical AAVE sentence such as "He be comin' in every day and sayin' he ain't done nothing" may be judged as having a deficient command of grammar, whereas, in fact, such a sentence is constructed based on a complex grammar which is different from, and not a degenerate form of, standard English. A hearer may judge the user of such a sentence to be unintellectual or uneducated when none of these is necessarily the case. The user may be proficient in standard English, and may be intellectually capable, and educated but simply have chosen to say the sentence in AAVE for any one of a number of social and sociolinguistic reasons such as the intended audience of the sentence, a phenomenon known as code switching. Another form of linguicism is evidenced by the following: in some parts of the United States, a person who has a strong Mexican accent and uses only simple English words may be thought of as poor, poorly educated, and possibly an illegal immigrant by many of the people who meet them. However, if the same person has a diluted accent or no noticeable accent at all and can use a myriad of words in complex sentences, they are likely to be perceived as more successful, better educated, and a legitimate citizen. In 1880, most deaf schools (where sign languages are transmitted from children from deaf families to the children from non-signing hearing families) had adopted oralism, an educational philosophy which prohibits the use of sign languages in favor of oral language. Many sign languages had all but become extinct during this time, sometimes called the "Deaf Dark Ages" by deaf people. In the 1960s, the United States became the first major country to switch back to manualism. Still, many first-world nations retain oralist educational philosophies and attitudes. Linguicism, of course, applies to written as well as spoken language. The quality of a book or article may be judged by the language in which it is written. In the scientific community, for example, those who evaluated a text in two language versions, English and the national Scandinavian language, rated the English-language version as being of higher scientific content. The Internet operates a great deal using written language. Readers of a web page, Usenet group, forum post, or chat session may be more inclined to take the author seriously if the written language is spelled and constructed in accordance with the written norms of the standard language. The Coptic language. At the turn of the 8th century, Caliph Abd al-Malik ibn Marwan decreed that Arabic replace Koine Greek and Coptic as the sole administrative language. Literary Coptic gradually declined such that within a few hundred years, and suffered violent persecutions especially under the Mamluks, leading to its virtual extinction by the 17th century. Language policy of the British Empire in Ireland, Wales and Scotland. Cromwell's conquest, the long English colonisation and Great Irish Famine made Irish a minority language by the end of the 19th century. It had no official status until the establishment of Republic of Ireland. In Wales, speaking of the Welsh language in schools was prohibited. Scottish Gaelic also had no official status until the end of 20th century. Scots was not considered "a suitable medium of education or culture". Basque: Public usage of Basque was restricted in Spain under Franco, 1939 to 1965. Galician and Catalan have similar histories. Kurdish: Kurdish remains banned in Syria Until August 2002, the Turkish government placed severe restrictions on the use of Kurdish, prohibiting the language in education and broadcast media. Vergonha is the term used for the effect of various policies of the French government on its citizens whose mother tongue was one of so-called patois. In 1539 with Article 111 of the Ordinance of Villers-Cotterêts, French (the language of Ile-de-France) became the only official language in the country. Use of the languages of southern France (langues d'oc) as well as Breton in education and administration was prohibited. 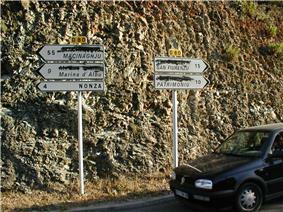 The French government has not ratified the European Charter for Regional or Minority Languages. Magyarisation in the 19th-century Kingdom of Hungary. Germanisation: Prussian discrimination of Western Slavs in the 19th century, such as the removal of the Polish language from secondary (1874) and primary (1886) schools, the use of corporal punishment leading to such events as Września school strike of 1901. Russification: 19th century policies on the territories seized due to partitions of the Polish-Lithuanian Commonwealth, such as banning the Polish, Lithuanian and Belarusian languages in public places (1864), later (1880s) Polish was banned in schools and offices of Congress Poland. Under the Russian Empire there were some attempts in 1899–1917 to make Russian the only official language of Finland. In the Soviet Union, following the phase of Korenizatsiya ("indigenization") and before Perestroika (late 1930s to late 1980s), Russian was termed as "the language of friendship of nations", to the disadvantage of other languages of the Soviet Union. Suppression of Korean during Japanese rule in Korea, 1910 to 1945. Quebec's language policies have been frequently noted as linguistic discrimination against the province's Anglophone population (see Legal dispute over Quebec's language policy). Dutch in Belgium after its independence in 1830. French was for a long time the only official language and the sole language of education, administration, law and justice despite Dutch being the language of the majority of the population. This led to a massive language shift in Brussels, the capital. Discrimination slowly diminished over the decades and formally ended in the 1960s when the Dutch version of the constitution became equal to the French version. The policy of Ukrainization in post-1991 Ukraine is discriminatory towards the Russian-speaking population of Ukraine's Eastern and Southern regions. ^ Quoted in Skutnabb-Kangas, Tove, and Phillipson, Robert, "'Mother Tongue': The Theoretical and Sociopolitical Construction of a Concept." In Ammon, Ulrich (ed.) (1989). Status and Function of Languages and Language Varieties, p. 455. Berlin, New York: Walter de Gruyter & Co. ISBN 3-11-011299-X. ^ Bresnahan, M. J., Ohashi, R., Nebashi, R., Liu, W. Y., & Shearman, S. M. (2002). Attitudinal and affective response toward accented English. Language and Communication, 22, 171–185. ^ Bradac, J. J. (1990). Language attitudes and impression formation. In H. Giles & W. P. Robinson (Eds. ), Handbook of language and social psychology (pp. 387–412). London: John Wiley. ^ Jaspal, R. (2009). Language and social identity: a psychosocial approach. Psych-Talk, 64, 17-20. ^ Schütz, H., & Six, B. (1996). How strong is the relationship between prejudice and discrimination? A meta-analytic answer. International Journal of Intercultural Relations, 20(3–4): pp. 441-462. ^ Whitley, B.E., & Kite, M.E. (2010)The Psychology of Prejudice and Discrimination. Ed 2. pp.379-383. Cencage Learning: Belmont. ^ Lippi-Green, R. (2012) English with an Accent: Language, Ideology and Discrimination in the U.S.. Second revised, expanded edition. New York: Routledge. ^ Dicker, Susan J. (2nd ed., 2003). Languages in America: A Pluralist View, pp. 7-8. Multilingual Matters Ltd. ISBN 1-85359-651-5. ^ Jenkins, Jennifer (2003). World Englishes: A Resource Book for Students, p. 200. Routledge. ISBN 0-415-25805-7. ^ Repression of Kurds in Syria is widespread, Amnesty International Report, March 2005. Skutnabb-Kangas et al. (eds. ), Linguistic human rights: overcoming linguistic discrimination, Walter de Gruyter (1995), ISBN 3-11-014878-1. R. Wodak and D. Corson (eds. ), Language policy and political issues in education, Springer, ISBN 0-7923-4713-7.